DATE/TIME: January 16, 2018 / 1:00 p.m.
San Bernardino- On January 16, 2018, an adult dependent caretaker, identified as Dewaina Cunningham, was arrested following an investigation of the physical and mental abuse of a mentally disabled adult. The abuse allegations were reported by New Discovery Residential Services, an adult board and care home located at the 6100 block of Blythe Ave. in San Bernardino. Dewaina Cunningham worked at the location for approximately one year and she was responsible for the care of dependent adults. In November 2018, residence surveillance video recorded Cunningham using a stun gun to mentally intimidate and physically assault the victim. Detectives interviewed Cunningham and located corroborating evidence. Cunningham was arrested and booked at the Central Detention Center for a felony, PC 368(b)(1) - Dependent Adult Abuse. The crime was cross-reported to San Bernardino County Adult Protective Services. 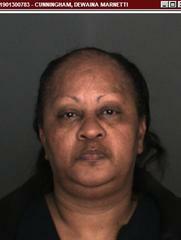 Cunningham has been employed as a caretaker at other board and care facilities in the County of San Bernardino. Investigators are releasing the Cunningham's photograph to the public in an attempt to identify additional victims or unreported incidents. Anyone with information regarding this incident is urged to contact the San Bernardino County Sheriff's Department - Central Station at (909) 387-3545. Callers wishing to remain anonymous may contact the We-Tip Hotline at 1-800-78CRIME (27463), or you may leave information on the We-Tip website at www.wetip.com.